Published: Dec. 17, 2015 at 03:17 p.m. Updated: Dec. 18, 2015 at 09:45 p.m. The fantasy playoffs in full swing. This is when things get serious. Let's not mess around. Time to get to the Stock Watch and help you figure out your playoff situations. We've been worried about this part of Jones' schedule for some time now. Two matchups against the Panthers was never going to be a good thing. What we didn't count on was the Falcons offense (particularly Matt Ryan) looking so absolutely dreadful this late in the season. This week's matchup against the Jaguars looks good on paper, but Jacksonville has been in the bottom half of the league in fantasy points allowed to receivers in the last month. If Jones survives that then ... hello again, Josh Norman. A.J. Green has frustrated many a fantasy owner this season, but it wasn't for lack of opportunity. The Bengals wideout has averaged nine targets per game this season even if it hadn't translated to fantasy points. That's changed in the past couple of weeks with Green posting 18-plus points in three straight games. This week he faces a porous 49ers secondary and could see even more targets if Tyler Eifert isn't available to play. It wouldn't be the Stock Watch if we didn't have a player listed because of an injury to someone else on his roster. Thankfully it doesn't look like T.J. Yeldon's sprained MCL will be season-ending, but it will keep him out of this week's contest against the Falcons. That should mean a much bigger workload for Robinson, who saw success last season in a starting role. Facing Atlanta's suspect run defense should help quite a bit. 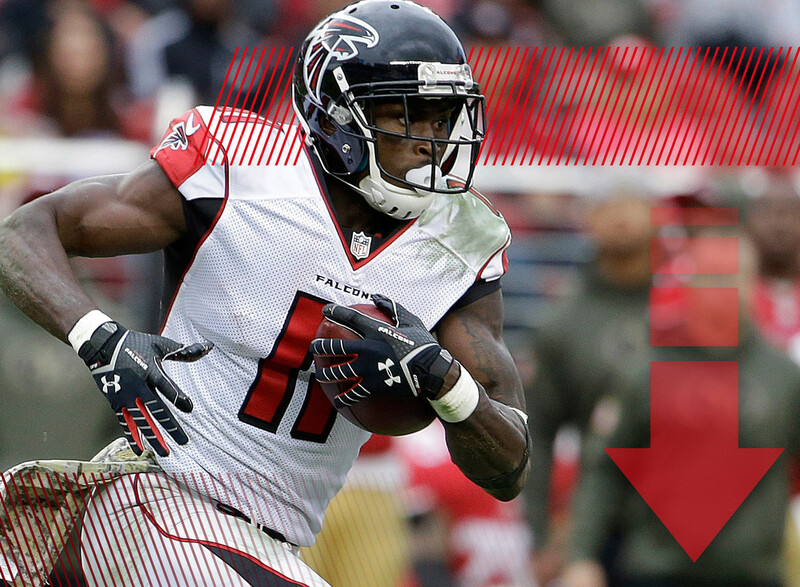 Cooper has been the top rookie wide receiver in the league this season. But that has come with plenty of inconsistency. The low point was in the Week 14 win over the Broncos in which Cooper failed to make a catch on eight targets. In the meantime, fellow youngsters Clive Walford and Seth Roberts started to see more action in the offense. There's always the potential for Cooper to post a big fantasy number, but his volatility means he could also post a very low total as well. Kelce was one of the tight ends for whom we had great hope this season, but he's struggled to find a consistent niche in the Chiefs offense. Having eight combined targets in the past two games isn't a recipe for general success. His next two matchups against the Ravens and Browns aren't particularly favorable, which looks even worse if he's not getting a lot of targets. We've been big on David Johnson all season long, but he's really moved up in the fantasy world after injuries to Chris Johnson and Andre Ellington. With a combination of power and speed as well as an ability to be a dangerous receiver, the rookie is making a case for being drafted early as an RB2 next season. That showcasing should continue this week against the Eagles. Yet another running back who will see extra opportunities because of an injury. Hightower had 29 touches last week, more than Mark Ingram saw in a single game all season. This week's matchup against a rejuvenated Lions defense isn't particularly great on paper but because of a sheer volume of potential touches, Hightower should warrant strong consideration for a spot in your lineup. For the past couple of weeks, we've been waiting for LaFell to break out while many of his pass-catching teammates were dealing with injuries. But in his past three games, he's posted 95 receiving yards ... total. Now that Rob Gronkowski is back and Julian Edelman is getting healthy, LaFell's value takes an even further dive. Russell Wilson has been handing out touchdown passes like Santa Claus delivering gifts. Lockett has not been left out of this bounty. He's broken out of his role as being just a kick returner and has become a legitimate deep threat in a red-hot passing offense. This week he faces a depleted Browns secondary and there's no reason to believe that the good times will continue to roll. Draughn's shelf life as a fantasy commodity was always going to be limited but last week he and the rest of the 49ers offense was shut down in what was a favorable matchup against the Browns. This week's contest against the Bengals is much less favorable. There should be plenty of touches and targets available for Draughn, but the production will probably be lacking.